Kaleidos is an award-winning “ColorToys” set of wooden blocks from Brinca Dada that not only allows children to discover an array of hues as they construct with 42 different colors, but shows them how blocks can be used for so much more than simply stacking. Kaleidos features unique notched blocks that allow for various combinations of hue, value, and intensity—the basic attributes of color. 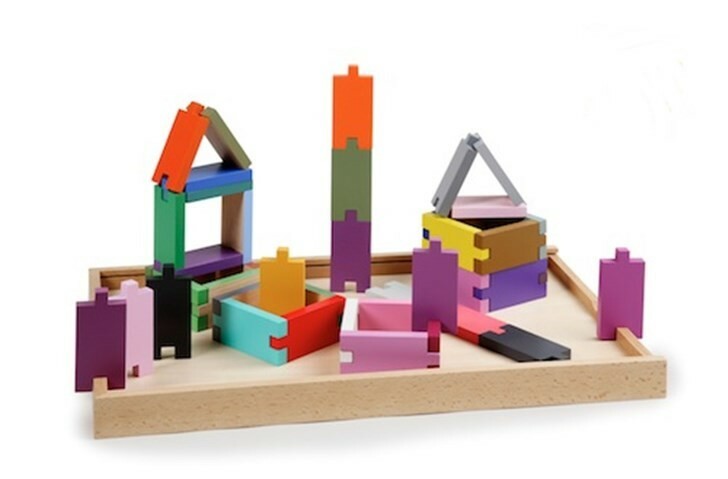 The notches let kids build out with their blocks rather than just stack them, plus the color design possibilities are even greater than you’d imagine because each block features natural wood grain on one side. Kaleidos was designed by renowned toy designer and early childhood education expert, Karen Hewitt of Learning Materials Workshop and this open-ended toy is sure to delight and educate your child as he/she plays. Made with safe, sturdy Beechwood and non-toxic, lead-free paints. Kaleidos is an award-winning "ColorToys" set of wooden blocks from Brinca Dada that not only allows children to discover an array of hues as they construct with 42 different colors, but shows them how blocks can be used for so much more than simply stacking. Kaleidos features unique notched blocks that allow for various combinations of hue, value, and intensity�the basic attributes of color. The notches let kids build out with their blocks rather than just stack them, plus the color design possibilities are even greater than you'd imagine because each block features natural wood grain on one side. Kaleidos was designed by renowned toy designer and early childhood education expert, Karen Hewitt of Learning Materials Workshop and this open-ended toy is sure to delight and educate your child as he/she plays. Made with safe, sturdy Beechwood and non-toxic, lead-free paints.